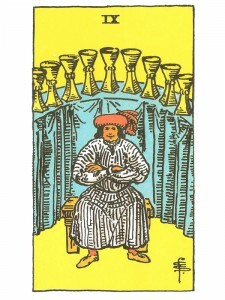 Nine of Cups suggests expansive happiness of the body, mind and spirit – fulfillment, emotional satisfaction. You have learned to compromise, to release your worry and problems by concentrating on simple ordinary pleasures. Manifest your potential – you can now create your own reality with the gift of your creative imagination. You have successfully faced all the terrors on your path home and your wish can now come true. Enjoy the deep and quiet inner contentment that comes with attaining your goals. There will be much happiness – your future is assured and material gains are now possible. You will experience good health and a sense of well-being. Life will seem easier as your worries disappear and new plans materialize. You have learned to come and go from your unconscious with ease, to work with your dreams and intuitive techniques and you can now visualize what you desire with such clarity that it comes into being. You have the resources and the knowledge to nurture others along the same path you have traveled, for you now recognize that nothing serves you better than a simple good time. Let your contribution fulfill you – “feel” the spirit of life as you create with your talents and manifest your magic. The impact of the higher mind on the Emotional Plane. With the resulting increase in emotional and creative awareness there is great comfort and joy with yourself and life in general. You have good emotional support systems in place, giving you emotional security and restorative power. Abundance of energy. Desires are being fulfilled. You are deeply compassionate and creative as you are in touch, in tune. An artistic or poetic lifestyle of the highest order. Interest and work in the arts, theater or music. Sensitivity, a dramatic personality. You may wear your heart on your sleeve. Benevolent power. Restorative power. How have your wishes been fulfilled? What pleasures are being experienced? What do you feel smug about? Can you visualize it in detail? In the first position: You are meant to enjoy life with the wide range of sensitivities you have been blessed with. Yours is the art of living. Your learning is hands on, experiential and your teaching is by example and the content of your creative projects. In the second position: The depth of your creative resources are with you wherever you go and nothing can take them away from you. These talents can be applied in a wide range of pragmatic application as necessary so you are secure in any set of circumstances. In the third position: The emotional backing, all the energy you will need, is coming your way. What is now available to you is the result of your past work in your Emotional Plane, with relationships and/or your creative projects. You may relax and simply enjoy the moment. In the fourth position: You are in love with the possibilities that love has for bringing and keeping people together, its positive binding attributes. Identification of commonalities. Family, profession, nationality are a few of the ways you may choose to package your emotional identity. In the fifth position: You are fully aware of your good fortune with emotional matters. intellectual satisfaction with product or conduct of relationships, family, extended family, projects of compassion. Or mental satisfaction with the progress of creative endeavors. In the sixth position: Can you handle emotional success in large quantities? The near future sees you under the most fortunate of circumstances in your emotional and creative affairs. In the seventh position: The ego will be most satisfied with the possibilities in your emotional world. It almost looks too good to be true. In the eighth position: You are strong now and others can lean on you for support. This could well be a time for feasting, as all the senses are in full play wanting to enjoy the luxury of the moment. In the ninth position: A time of great joy, rejoicing at the good results in your interrelationships with the people you hold close in your heart. Anyone in your sphere of influence is also benefiting at this time. In the tenth position: You are to be rewarded with a rush of energy, of backing beyond your expectations. This is all energy you will need to complete your projects and meet the demands others will place on you. I would say to Samantha not to use reversed cards. There are enough positives and negatives in the deck to get an answer. It’s confusing with all the positives and negatives contradicting one another and I am needing very specific help into the issue can u help?